Web site managers or bloggers looking for a centralized way to keep tabs on basic Web stats should check out Ego from Garrett Murray. This $2 statistics aggregator supports Twitter and Google Analytics, hosting services Feedburner and Squarespace, and the self-hosted statistics package Mint. Ego Trip: Ego uses color coding to let you know at a glance what Web stat you’re tracking—orange means Web traffic, while blue shows Twitter numbers. After you install Ego, you go through some very simple steps to set up all the sites you want to monitor. When you’re finished, the main screen will display those sites in a color-coded list. 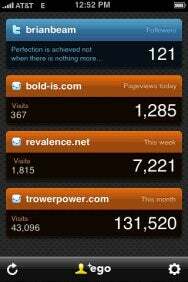 For web stats (orange), just tap on the colored bar to cycle among daily, weekly, monthly, and yearly page views and visits. Feedburner stats (red) will show your subscription count while Twitter stats (blue, of course) will display your last tweet, follower count, and tweet count. Antoine de Saint-Exupéry once said “Perfection is achieved not when there is nothing more to add, but when there is nothing left to take away.” While I would like to see the developers add support for other services (Facebook and LinkedIn, for example), Ego’s user interface is simple and elegant, and I can’t think of anything I would remove. Ego is compatible with any iPhone and iPod touch running the iPhone 2.2.1 software update.